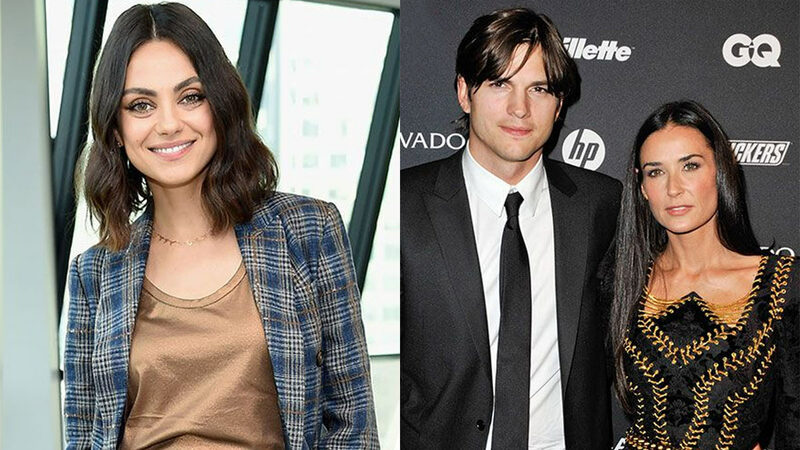 When Ashton Kutcher and Demi Moore first started dating, people gave a serious eye-roll at their 15-year age difference (which is no one's business anyways, obviously), but Mila Kunis just defended her now-husband's former relationship. "They had, like, a normal, real relationship," she said in an interview for the WTF With Marc Maron podcast. "They had three kids they were raising. It was, like, a normal life." When Ashton and Demi met, he was 25 and she was 41. She had three daughters, Rumer, Tallulah, and Scout, with her ex-husband Bruce Willis. Despite the age difference and the fact that Demi already had children, their relationship was normal, Mila said. "He was younger but he loved those kids." She also confirmed that Ashton still has a relationship with the girls to this day. Now, Ashton and Mila have been married for three years, and the story of how they "met" is hilarious. They obviously knew each other as teenagers on That '70s Show, but they had no feelings for each other during that time. They reconnected at an awards show years later, and initially, their relationship was strictly friends with benefits. "We were like, 'Let's just hook up. Let's have fun. We're both single. We both trust each other. Everything's great.' None of us wanted tension. OK, great. We hooked up for three months," she said. Then, she realized she had feelings for him after he told her he was dating someone else at the same time. "I felt like I got punched in the gut, literally overnight," she said. "He said something, and I was like … 'Oh, my god. I love this man, and I have to walk away because this is not the agreement that we had. And so I'm going to speak up.'" Once she told Ashton, he asked her to move in, and the rest is history. If this plot sounds familiar, it's because they both starred in separate movies in which the same exact thing happens. Life, man!